Introduction: Phenotypic characterization of COPD subjects may rely on clinical and physiological manifestations, imaging, assessment of patient-related outcomes (health related quality of life), COPD comorbidities, COPD exacerbations and systemic inflammation. The aim of the study was to evaluate and to analyze the health-related quality of life (HRQL) in COPD patients classified into different phenotypes. Methods: 395 consecutive COPD patients were enrolled into the study. Spirometric data were analyzed (FEV1, FVC, FEV1/FVC). HRQL was assessed by the St. George Respiratory Questionnaire (SGRQ), COPD Assessment Test (CAT) and Clinical COPD Questionnaire (CCQ). Results: The cohort consisted of 395 COPD patients with mean age 62.7 ± 9.4 years, 79 % were males. 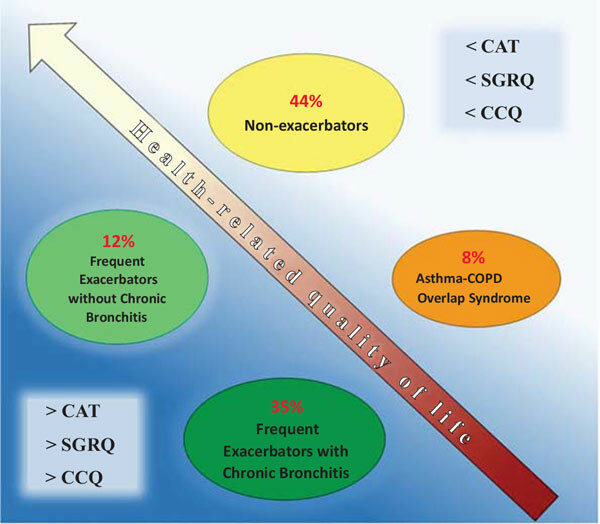 Patients were divided in 4 groups according to phenotypes: 44% of the patients were nonexacerbators, 35% frequent exacerbators with chronic bronchitis (CB), 12% frequent exacerbators without CB, and 8% were patients with asthma-COPD overlap syndrome (ACOS). There were statistically significant differences in HRQL and lung function between COPD phenotypes. Frequent exacerbators with chronic CB and without CB had the similar total SGRQ scores, CCQ scores and CAT, and these scores were worse in comparison with HRQL of non-exacerbators and patients with ACOS. Conclusion: Frequent exacerbators with chronic CB and without CB have a more severe deterioration of the HRQL and worse lung function then non-exacerbators and patients with ACOS. Keywords: Clinical COPD Questionnaire (CCQ), COPD Assessment Test (CAT), COPD, health related quality of life, HRQL, phenotypes, St. George Respiratory Questionnaire (SGRQ). Keywords:Clinical COPD Questionnaire (CCQ), COPD Assessment Test (CAT), COPD, health related quality of life, HRQL, phenotypes, St. George Respiratory Questionnaire (SGRQ). Abstract:Introduction: Phenotypic characterization of COPD subjects may rely on clinical and physiological manifestations, imaging, assessment of patient-related outcomes (health related quality of life), COPD comorbidities, COPD exacerbations and systemic inflammation. The aim of the study was to evaluate and to analyze the health-related quality of life (HRQL) in COPD patients classified into different phenotypes.